Hello friends, let's talk directly about recruitment. The Rajasthan HC department has recently released new notification. Which is being taken to recruit Legal Researcher? The last date for applying for this recruitment is 18 Feb 2019.Read the full post for complete information about a vacancy. See educational qualifications, fees, salaries and other information below. This recruitment is done by Rajasthan HC. For information on upcoming recruitment of Rajasthan HC on Gktricks.in to visit. Rajasthan HC will be many recruited in 2019. You will notice that time to time via our website. Description: Written examination date has not yet come. The complete schedule on the date of the written test will be reported. To visit you every day. The written test will be how? What kind of questions is optional objective? Rajasthan HC Legal Researcher recruitment of academic qualifications would be required to join? This question will be in all the candidates too. If you want to join the recruitment, Law Degree qualification must have. For more description information see the official notification. Below is the official notification. Must read the official notification for information on fees. Candidates who receive a discount on age, important to keep your certificate. General candidates to join the Rajasthan HC recruitment fees - 100 Rs. The fees above General / ST / SC / OBC classes is different. Complete information is given below in related fees. How much would you pay? Grade Pay What? By the way, the information above is provided. On the basis of academic ability and grade level, receive different salaries. 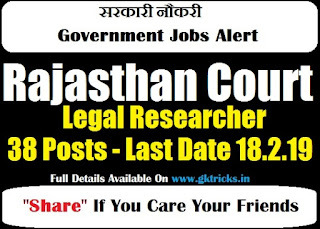 Rajasthan HC Legal Researcher salary - 20000. Rajasthan HC recruitment should be the age limit to join in? The details of the information you read well. According to our information, the maximum age limit for recruitment to join is 33 years. Have a reservation at the age of different castes. description information is updated below. We mentioned above that of the general age limit. Which is the maximum age limit? 10-15 days before the exam admit card will be announced. Which can be downloaded by visiting the official website. The recruitment of the "Result & Admit Card" to visit every day on Gktricks.in View results online? The test results you can see online, mobile and laptop. Given below for which you have to understand the process carefully. Written test or interview results are expected within 30 days. We will give you the notification on the results. Your mobile/laptop must have an Internet connection. Open Your Mobile Browser Like (Chrome, Mozilla And etc). Open to the official website of Rajasthan HC. Go to the result section (Rajasthan HC Result). Put Your Roll number and press OK. Your results will be displayed. Do not forget to print out the results. It will work in the future. Useful Topics About Rajasthan HC Recruitment 2019: Some useful topics are given below. Which is concerned with the recruitment. Official details are given below. The last date to apply before. Subscribe us to know about the future Rajasthan HC organizations Recruitment 2019. Rajasthan High Court Notification 2018 : Hello friends, let's talk directly about recruitment. The Rajasthan High Court department has recently released new notification. Which are being taken to recruit Driver and Class IV Employees. The last date for applying for this recruitment is 13 March 2018. Read full post for complete information about vacancy. See educational qualifications, fees, salaries and other information below. Rajasthan High Court Driver and Class IV Employees Exam Date : Written examination date has not yet come. The complete schedule on the date of the written test will be reported. To visit you everyday. The written test will be how? What kind of questions are optional objective? Rajasthan High Court Department Name - This recruitment is done by Rajasthan High Court. 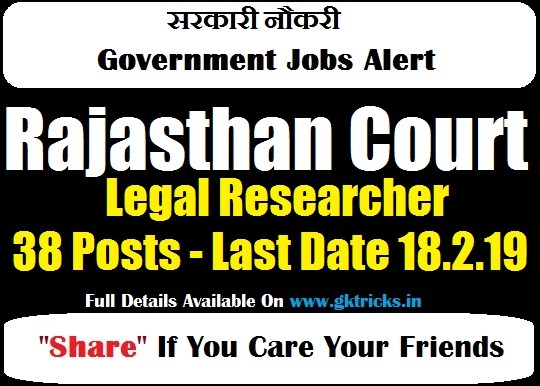 For information on upcoming recruitment of Rajasthan High Court on Gktricks.in to visit. Rajasthan High Court will be many recruited in 2018. You will notice that time to time via our website. Required Education For Rajasthan High Court Driver and Class IV Employees Recruitment : Rajasthan High Court Driver and Class IV Employees recruitment of academic qualifications would be required to join? This question will be in all the candidates too.If you want to join the recruitment, 10th qualification must have.For more information see the official notification. Below is the official notification. Age Details : Rajasthan High Court recruitment should be the age limit to join in? The details of the information you read well. According to our information, the maximum age limit for recruitment to join is 35 years. Have a reservation at the age of different castes. This information is updated below. We mentioned above that of the general age limit. Which is the maximum age limit. Fees Details : Must read the official notification for information on fees. Candidates who receive a discount on age,important to keep your certificate. General candidates to join the Rajasthan High Court recruitment fees - 100 Rs. The fees above General / ST / SC / OBC classes is different. Complete information are given below in related fees. Walk In Interview : Rajasthan High Court will recruit to join the interview? Interview Tips sure you read above. Selection will be by interview of Rajasthan High Court.Use our website to see the results of interviews.Which is created by a few of our interview tips given above. For more information read our old posts. Rajasthan High Court Selection Process - According to government regulations. See the details below. Rajasthan High Court Watch Result Online : View results online? The test results you can see online, mobile and laptop. Given below for which you have to understand the process carefully. Written test or interview results are expected within 30 days. We will give you notification on the results. Your mobile / laptop must have an Internet connection. Open Your Mobile Browser Like (Chrome, Mozilla And etc). Open to the official website of Rajasthan High Court. Go to result section (Rajasthan High Court Result). Put Your Roll number and press OK. Your results will be displayed. Do not forget to print out the results. It will work in the future. Useful Topics About Rajasthan High Court Recruitment 2018 : Some useful topics is given below. Which is concerned with the recruitment. Official details are given below. Last date to apply before. Subscribe us to know about the future Rajasthan High Court Recruitment 2018.